Delicata Delish – the answer to your squash problem. Not that you have a squash problem. Also known as the Sweet-Potato or Bohemian squash, the Delicata squash is considered a novelty squash. This makes sense as it does blend in well with the other novelty gourds in my seasonal gourd basket (see McSweeney’s for more on this). However, I have finally found a recipe that will help you take this vegetable – which is technically a fruit – seriously. After little success in finding squash recipes that were not soup, I actually found this one while searching for new ways to use quinoa. As it turns out, squash and quinoa go together like chocolate and peanut butter. The source is Allrecipes.com and it is really simple to make: you basically roast the squash with butter in the oven and then make a basic quinoa pilaf stuffing with shallots, garlic and pine nuts. It’s the kind of easy pilaf that could easily be embellished with herbs or other vegetables (get creative!) and you could easily substitute whatever squash you’re getting in your CSA share. The extra pilaf makes for a good lunch the next day, too. A gorgeous head of red cabbage calling out for it’s friend, the spätzle. And… a bag of sweet potatoes. These are our current challenge. What do you do with sweet potatoes? Arrange the squash halves cut side up in a baking dish. Fill dish with about 1/4 inch water. Place 1 tablespoon butter on each half, and season halves with salt and pepper. Cover dish, and bake squash 30 minutes in the preheated oven, or until very tender. Place quinoa in a pot with 2 cups water. Bring to a boil. Reduce heat to low, cover, and simmer 15 minutes. Melt the remaining 1 tablespoon butter in a skillet over medium heat. Stir in shallots and garlic, and cook until tender. Stir in pine nuts, and cook until golden. Gently mix into the pot with the cooked quinoa. Cut the squash halves in half, and fill each quarter with the quinoa mixture. 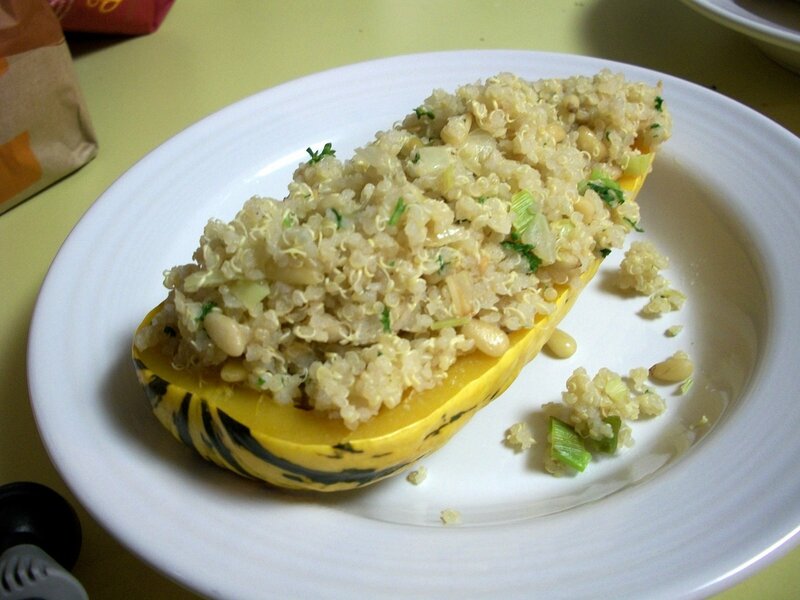 Serve each stuffed squash quarter on a bed of the remaining quinoa mixture. This entry was posted on November 4, 2010, 10:39 pm and is filed under kitchen. You can follow any responses to this entry through RSS 2.0. You can leave a response, or trackback from your own site. I love squash, bordering on a healthy obsession, and I cant wait to try this recipe. It sounds and looks delicious. Coincidentally my other love/obsession is sweet potatoes. The first and easiest thing I do with them is peel, slice in thick rounds (2 inches thick), toss in olive oil, thyme, red pepper flakes (if you like it spicy), maybe some garlic, and then roast in a hot oven (400 degrees) until nice and soft and a little carmely…usually 40 to 50 minutes! Tonight I am trying a sweet potato salad for the first time. Looking forward to trying this tonight. Thanks for the inspiration. Love me some delicatas. Just this week I stuffed one with a mix of Israeli couscous, chorizo, chard and cheddar. The best part is you can eat the skins!